Quick setting lightened multi-consistency cement-based adhesive for fixing porcelain stoneware and natural stone in medium and large sizes. Can also be used in a single coat. 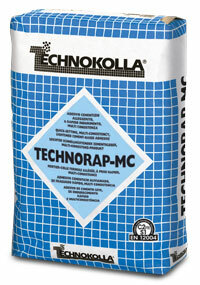 - Quick-fixing ceramic tiles of all types, even large sizes, on indoor and outdoor walls and floors. - Suitable for use when high performance is required within a short time, such as: tile laying in industrial environments, swimming pools or facades. - Fixing composite marble with an average sensitivity to water* on indoor surfaces. * Composite materials up to 60x60 in size can only be fixed indoors. Cement-based plaster, cement-lime mortar, gypsum-based plaster¹, anhydrite screeds¹, cement-based screeds, concrete, aerated concrete, old ceramic floors, old floors in linoleum², PVC² or vinyl², plasterboard, RASOLASTIK-PLUS line and RASOGUM.